Monster Energy congratulates Sarah Hoefflin and Maggie Voisin for taking silver and bronze medals in Women’s Ski Slopestyle at X Games Aspen 2019 after a heated final. With bright blue skies and sprawling crowds, the scene was set for an epic final. Hoefflin threw down the first clean run of the day, which earned her a 90.00, but would have to settle for a silver medal after Kelly Sildaru scored a 99.00. 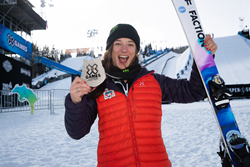 Hoefflin is no stranger to hitting the podium after winning gold in Women’s Ski Big Air at X Games Aspen 2018, and put down an impressive run, which included a disaster switch 270 on and a front 440 off the cannon, in the rail section. Then on the jumps, she tossed a massive switch 1080 on the money booter, which had the judges and the crowd going wild. “Today was really special,” said Hoefflin following the event. “The course was big, but really fun, and I’m just excited I landed today,” she continued. The highly technical slope course kept skiers on their toes, as there was a barrage of falls through the finals. Despite a bobble on her first run, Maggie Voisin was able to put down a clean second run, which earned her 87.66 and a spot on the podium. She sent a smooth backside 620 off the cannon, into a right cork 900 tail grab, switch left 900 mute, into a left dub 1260 safety on the money booter. With third place secured, Voisin laid it all on the line on her third run, but was unable to land smoothly and had to settle for a bronze medal. X Games Aspen 2019 continues throughout the weekend with Monster Energy Athletes ready to win more medals. performances and X Games Extra shows will be streamed on the @XGames YouTube, Facebook and Twitter pages. Visit http://www.monsterenergy.com for exclusive updates from X Games Aspen 2019 including photos, videos, and contest results as they happen.